I made some AMAZING Ice Cream Sandwiches. You can go to my new website here to see them! You won’t regret it, I promise. Yum!! In case you were wondering if I was still baking at all, I made some adorable Minnie Mouse cupcakes that you can see on my other blog here: Minnie Mouse Birthday Party. Hello to those of you that still might visit here every now and then. Thank you SO much for your support and comments these years. I’ve loved sharing my cooking misadventures and adventures with you all. This isn’t the end to my blogging adventures, though. I’ve decide to change course and follow my current passions in a brand new blog: Lunges, Laundry, and Lipgloss. This blog will focus on my new endeavors in staying fit, raising three crazy kiddos, and maybe some fun lifestyle/shopping tips. Plus, I hope to drop a few recipes in there, too. I hope that many of you will stop by and check me out – though it’s still a baby blog with just one post so far. Anyone who likes to experiment in the kitchen will tell you that having so many recipes under their belt can be both a good and a bad thing. On the one hand, you have so many recipes to choose from when it’s time to prep your meals; on the other, making the choice can be quite difficult when you have too many options. An article on the New York Times goes as far as calling the problem of having too many choices “a paralyzing problem”. But luckily, you can use a fun bingo game to create meal plans and menus for the week, eliminating the hassles of having to rifle through the hundreds of recipes you’ve mastered to be able to prepare something new for your family every day. Bingo has helped many households in surprising ways, with the UK Food Standards Agency even using it to promote healthy eating with Eatwell Bingo. The popularity of the game is undeniable too. When Iceland Foods launched their own online bingo portal in 2012, their CEO, Malcolm Walker, said, “we are excited to take our popular consumer brand into the world of online bingo , which is something we know that many of our customers enjoy. Now mums – and dads – can come to Iceland Bingo, too.” Now bingo can help you and your family too, all while making meal planning much more fun and interactive. To play Menu Bingo, go through your recipe books (or choose from the dozens of recipes on Cooking Misadventures) for five recipes for each of the following categories: Main, Side 1, Side 2, and Dessert. 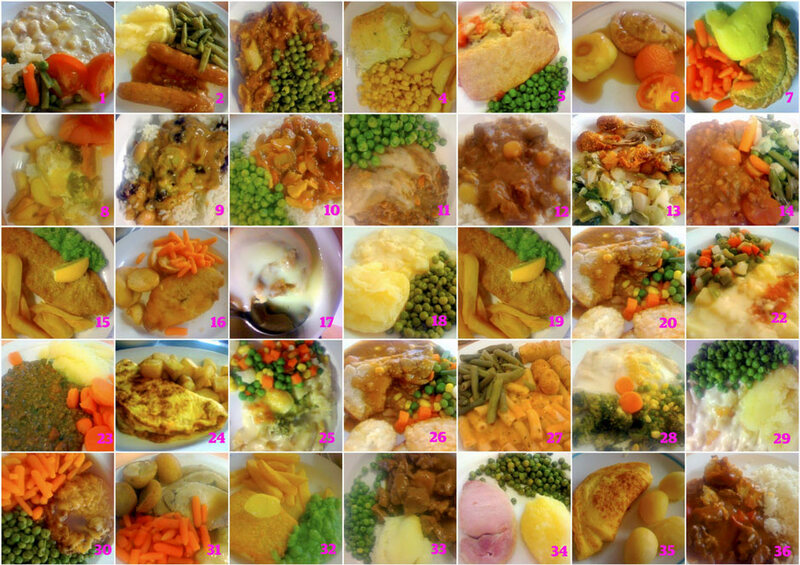 Once you have these twenty recipes, you can then plot them out on a bingo card template, with one column standing for each category. Label each item in the columns a number from 1-5. You could also fill out there boxes by asking the members of the family what they feel like having and taking those down. Once you’ve made your bingo card, it’s time to roll a die, with the number that you roll corresponding to the dish that you’ll be cooking. Take turns rolling the die for each category, and when someone rolls a six, they get to choose which of the items to have. Once an item has been picked already, make sure to mark it off, and then proceed to roll for the rest of the days of the week. You can have many variations of this game, such as a bingo card with seven items in each category – one for each day of the week – or even a bingo card each for breakfast, lunch and dinner. By taking some time out of the start of the week, you can cut back on your cooking prep time! So, my mojo is gone. 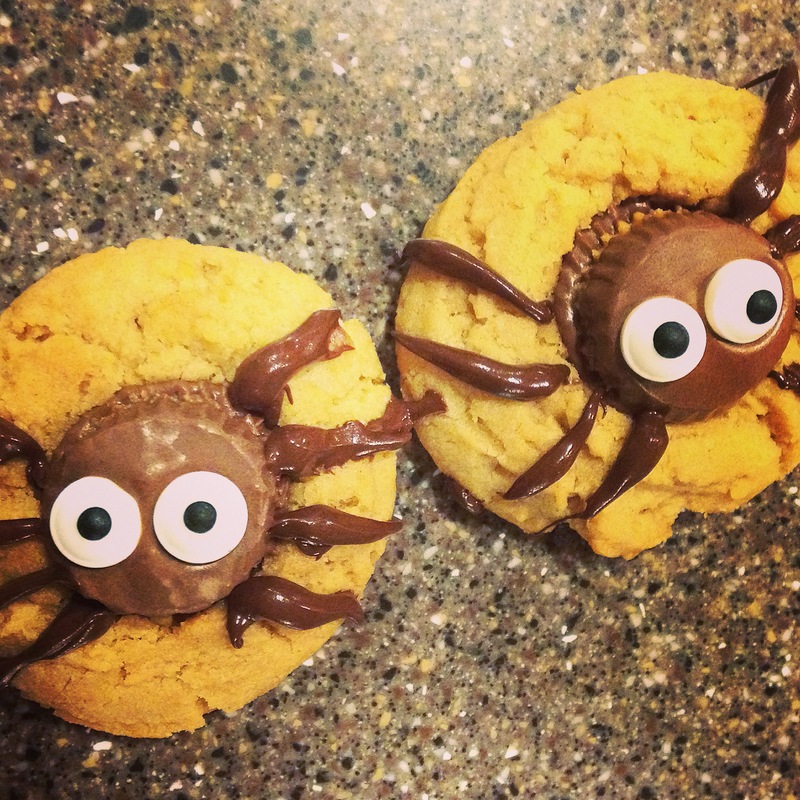 Anyhow, I thought I would quickly share a couple Halloween cookie ideas I made with my kids that they LOVED. And we all had a great time doing them. 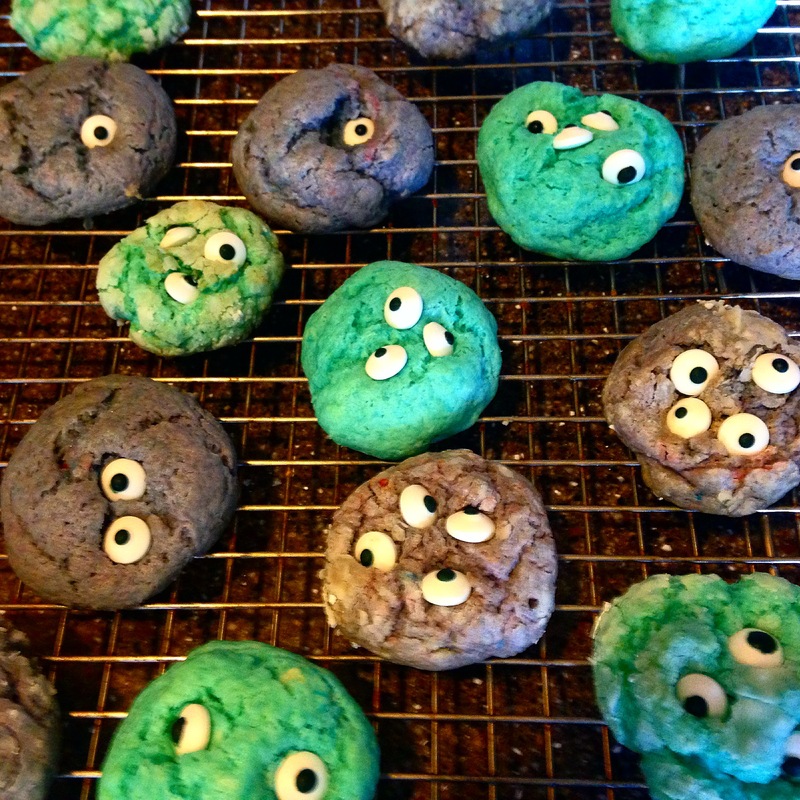 I am just going to post the link to the cookies since I didn’t really alter the recipes at all. Can I just say that candy eyeballs are super fun?! Ahhhh, take a deep breath, my friends. That gently yeasty buttery wafting smell…the smell of home, family, and fresh baked goodness. Oh, yes, it is finally bread baking season! Here’s an easy, sweet tasting bread for all occasions. Combine the milk, butter, sugar, and salt in a saucepan. Heat to lukewarm, stirring to soften the butter. Set aside. Lightly grease a mixing bowl, round the dough into a ball, and place it in the bowl. Cover, and let rise until very puffy, about 1 1/2 to 2 hours. Lightly grease a 9″ round cake pan. Gently deflate the dough, and round it into a ball. Place the ball in the prepared pan, and tent the dough gently with lightly greased plastic wrap. Let the dough rise in the pan for about 2 hours, until it’s nicely puffy. Toward the end of the rising time, preheat the oven to 350°F. Mix the reserved egg white with 1 tablespoon cold water, and brush some onto the surface of the loaf; this will give it a satiny, mahogany-brown crust. Bake the bread for 15 minutes, then tent it lightly with aluminum foil. Bake for an additional 20 to 25 minutes, until it’s a medium golden brown and its internal temperature registers 190°F on a digital thermometer. 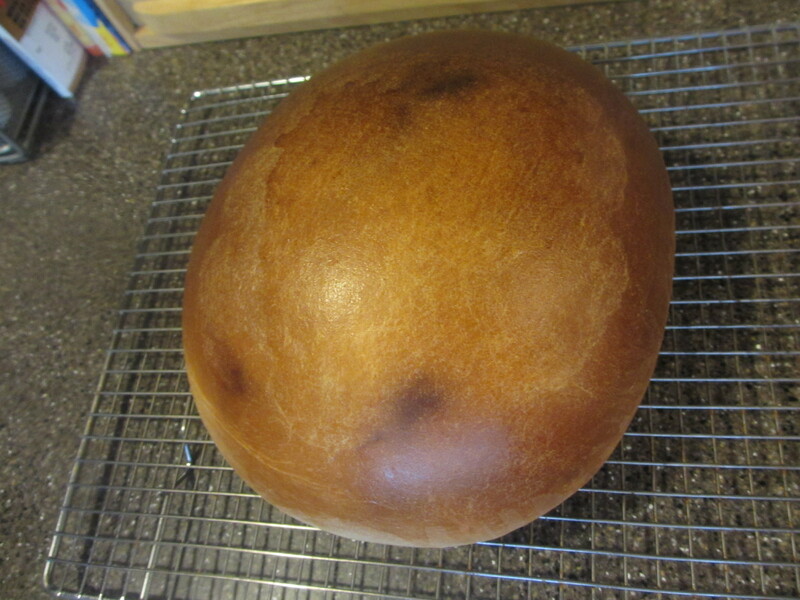 Whenever I place bread dough in a bowl to rise, I put it in the greased bowl, and then flip it over. so that the top is greased as well. That seems to keep it from drying out on top. I made this bread to go with our chili from the previous recipe. I wanted something sweeter to counter the savory of the chili. I thought it worked wonderfully. Additionally, this was a super easy recipe to make and it seemed pretty full-proof. Everyone enjoyed the bread, though Hubs thought the lemon flavor was a little much. I thought it was very similar to a Hawaiian bread recipe and found it worked well with the chili – and on it’s own as a dessert. 🙂 The kids all liked it, so I call it a success. The weather here in the great northwest took quite a turn last week. We went from weeks of sunny warm weather, to wet and much colder weather. Anyways, I’ve been trying to crockpot my way back into cooking a meal each week, and this recipe was a super easy way to do it – while honoring a return to cold weather food. Place all ingredients in crockpot and and cook on low for 8-9 hours. So, I have to be upfront and honest about something. Hubs may have helped me out the night before by prepping all the ingredients for me. This was super helpful because, as he put it, it would’ve taken me 45 minutes to prep what took him only 20. (It’s a sad, but true fact.) Anyways, that basically just led to me just dumping everything in first thing in the morning – SO easy. Now, this is not a gourmet chili or a specialized chili, or anything fancy like that. 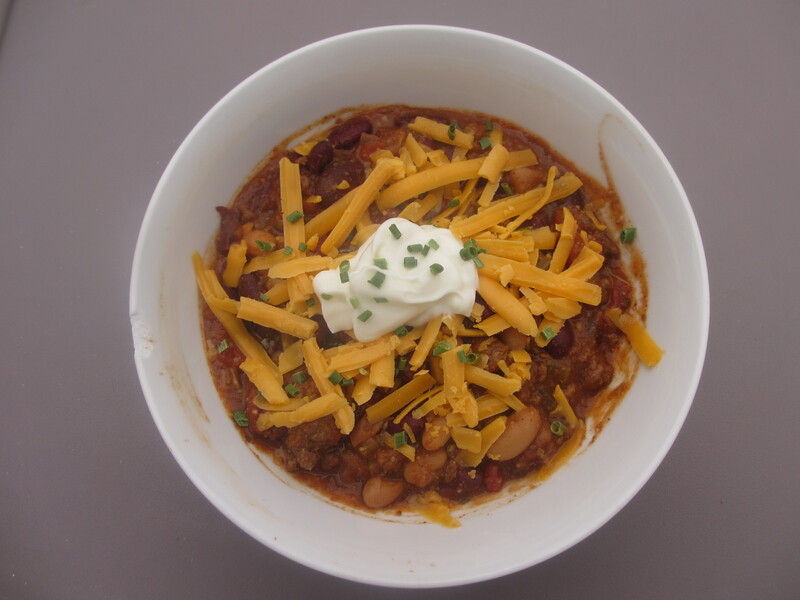 This is a regular basic chili that I think everyone would like. It’s hearty and delicious – and is wonderful for leftovers. I live with a man who is an amazing cook. I am definitely not. But I'm learning. 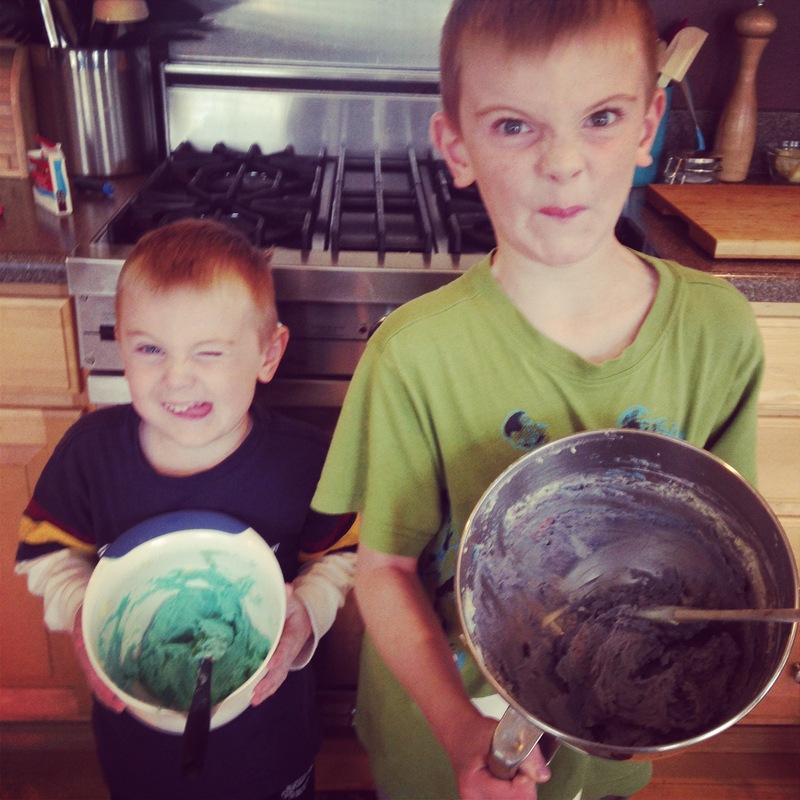 Join me as I share the ups and downs of figuring out this cooking thing.